A long blast south to the sun today. Leaving Ulm early in the morning to beat the traffic and heading out across a cold, damp Bavaria. Hitting the morning rush hour on the motorways around Munich we ride past the iconic Allianz Stadium, home of Bayern Munich. Crossing the border at Salzburg and through the Tyrol the weather didn't get much better. Chris was wearing all he had to keep warm. A short off-route diversion took us through the villages of Fell and Höf. After yesterday's incident, you'll be glad to hear that Deefor didn't. (Fell Höf. Geddit). Then, through a long tunnel and we emerged into south facing slopes and blue skies. Temperatures rose to 20C+ and the cold weather gear was packed away. Through Austria and across Slovenia to the Croatian border. It was a shock after crossing four countries in the Schengen Area to finally have to produce your passport. Then down clear roads to the Adriatic Coast and a delicious grilled, fresh fish supper sitting on the waterfront. Lovely. 350 miles, 8 hours (including stops). Making progress! Science update: Today Deefor was Prof. Sam's Guinea Pig. Wearing a recording vest that measures skin and core body, acceleration, heart rate etc. It will be fascinating to see what that lot made of the heated jacket! 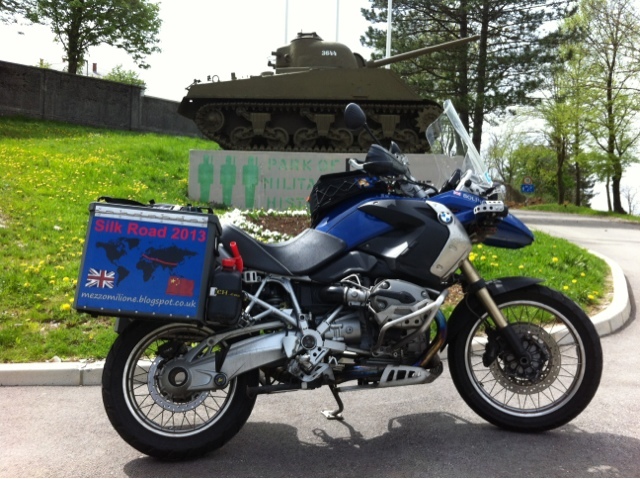 Today's picture was taken at Slovenia's Army Museum. We are now in what was the Communist Bloc so I am not sure what a US Sherman Tank is doing here.